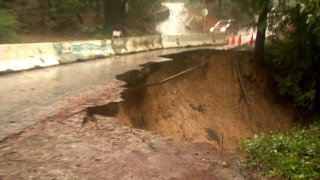 A section of road collapsed in the Santa Cruz Mountains during heavy storms that hit the Bay Area. A broken water pipeline in Santa Cruz was successfully repaired Friday after its leak caused an emergency water shortage, city officials said. The first pipeline repair attempt last Tuesday was unsuccessful. Residents who were asked to cut back last week can now resume normal wintertime water use. The Newell Creek Pipeline sprung a leak on Jan. 9 and proceeded to lose 1,500 gallons of water per minute. The pipeline is the main artery from the Loch Lomond Reservoir to the Graham Creek Water Treatment Plant, city officials said. During powerful storms, the flowing rivers and streams from which the city normally gets 95 percent of its water become too turbid, and reservoir water becomes a necessity. After the pipeline broke, Santa Cruz Water Department officials urged their 96,000 customers to reduce nonessential water use by 30 percent. Between Jan. 9 and the next day, residents cut their water use from 5.7 million gallons to 5.3 million gallons. However, the city was only able to produce 4.8 million gallons, including 1.1 million imported from the Soquel Creek Water District.